Stow-on-the-Wold is one of the bustling major marketing towns of the Cotswolds and famous for its antique shops. 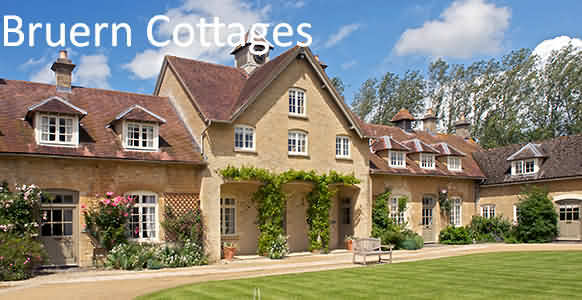 There is an excellent choice of Hotels, Inns, B&Bs and Self-Catering Cottages for accommodation and lodgings. Stow Lodge Hotel is situated in the heart of the Cotswolds in the historic hill top town of Stow-on-the-Wold, overlooking the market square with its many interesting galleries and shops. One of the hotels major features is its picturesque gardens that during the spring and summer months are full of vibrant colours and wonderful fragrances, where guests can sit out and enjoy the beautiful surroundings. Stow Lodge is one of only a few hotels in the Cotswolds that is still family owned and run, having been in the same family ownership for over 5o years. Sadly Mr and Mrs Jux are no longer with us, but their daughter Val Hartley and her husband Dave with their two sons Chris and Steve and their wives Amanda and Nicky are all involved in the day to day running of the Hotel. With help from the friendly local staff the hotel offers a very homely style of service where guests can relax and unwind in total comfort. The hotel was originally built in the mid 1700’s as the rectory, as the rector at the time required a larger residence. The hotel has been tastefully modernised over the years but retains much of its old world charm; crackling log fires in the bar and lounge during those cooler months, a false bookcase remaining in the lounge that once concealed a spiral staircase leading to a secret room and not to mention the tunnels leading off from the cellar, that are said to be older than the hotel itself. All Bedrooms are en-suite and have colour television, beverage making facilities, hairdryer, direct dial telephone, electric fan and radio. Several rooms have twin beds that can be zip linked together to make a super king size double bed. 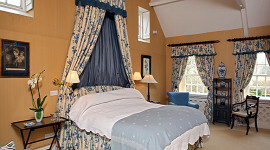 We also have three double bedded rooms with king size beds including one with a four poster bed. All bedrooms are situated in the main hotel or hotel coach house which is situated approximately 25 metres behind the hotel. The bedrooms are of very similar quality. A Chalet Suite is situated in the hotel grounds overlooking the garden. 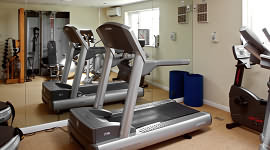 Room Rate Guide for Double Room Mid Week:- Low Season from £91.00 to High Season £135.00. Number Four is a contemporary boutique hotel. We have 18 beautifully appointed air-conditioned bedrooms, suites and a family room. Award winning Restaurant creates exciting dishes sourcing mainly local produce. At Number Four we offer a unique personal service from a friendly team committed to making your visit memorable. Our 18 air-conditioned bedrooms, with modern furnishings and crisp linens provide every facility for your comfort. We welcome children and can accommodate them in a family room or suite. We can provide cots and changing mats for babies free of charge. Dining in Restaurant is an important part of your visit to Number Four. At this stylish eatery, we have the team to serve up a combination of classic English and continental dishes, incorporating many locally, supplied products, with the emphasis on seasonality and flavour. We take pride in offering food of a consistently high quality and warm and friendly service. Relax and enjoy an aperitif or glass of champagne in our comfortable lounge bar prior to dining. The Bar is open all day and we welcome non-residents for a drink, snack or to dine with us. and inclusive of full English breakfast and VAT at the current rate. Rates are subject to change depending on dates chosen and availability. 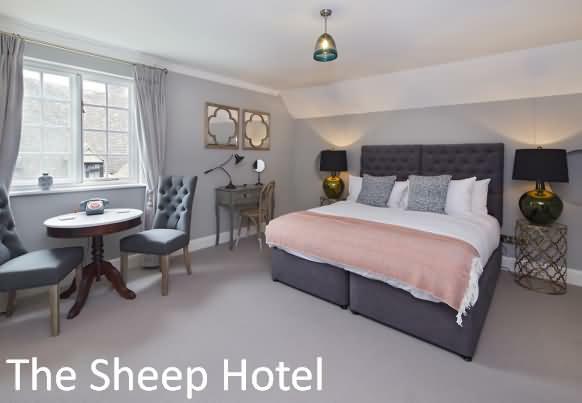 The Sheep Hotel is located just 2 minute walk from the town centre. All the rooms are decorated to a high standard, offering a comfy place to stay. Their sophisticated simplicity gives them a luxurious feel. They all have en-suite bathrooms and breakfast is always included. The ground floor of the Sheep includes plenty of dining space, as well as full length bar top and cosy fire. There’s an open kitchen and a wood-fired oven too. The kitchen is available all day, welcoming those not lucky enough to be staying the chance to come in for breakfast. There’s an a la carte menu offering a wide range of freshly cooked pizzas throughout the afternoon and evening. Families are welcome, and children have a bespoke menu. To complement the contemporary restaurant and bar, the garden and rear patio area features an outdoor dining area, built around a feature fireplace. We look forward to seeing you soon whether it be for a bite to eat, if you’re staying the night, or just a quick drink. 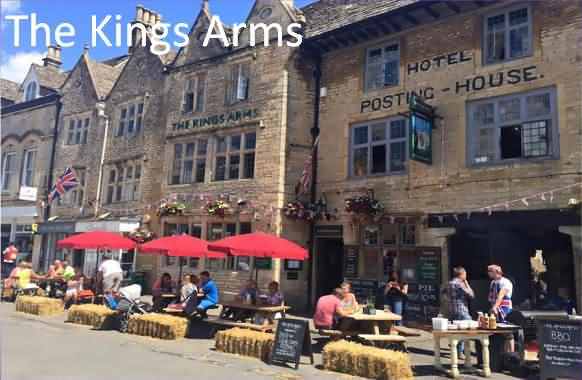 The Kings Arms Hotel is located in Stow on the Wold, just 23 miles from Oxford. Guests can enjoy the on-site bar. Free private parking is available on site. Some rooms have a sitting area for your convenience. You will find a kettle in the room. Stratford-upon-Avon is 18 miles from The Kings Arms Hotel, and Cheltenham is 15 miles from the property. Birmingham Airport is 36 miles away. This luxury country-house hotel is located in the Cotswolds, with wonderful views over 100 acres of grounds. 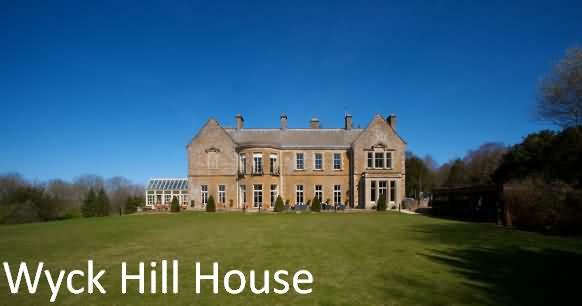 The Wyck Hill House Hotel & Spa has a spa for guests to enjoy, free broadband and free parking. Just outside Stow-on-the-Wold, Wyck Hill House has spacious, modern rooms with fresh-ground coffee, luxurious beds and bathrobes. Room service is available 24 hours a day. The spa offers Elemis and Jessica Nails treatments, as well as a 12-seater steam room and sauna. There are 6 treatment rooms, including a dual treatment room. 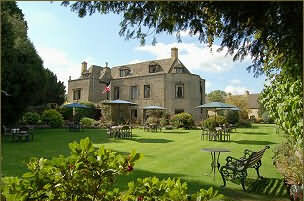 Wyck Hill House Hotel & Spa is close to Bourton-on-the-Water, Broadway and Chipping Camden. Cheltenham, known for its racecourse, is a 30-minute drive away. In the heart of the beautiful Cotswolds and within a few minutes' walk of the centre of Stow-on-the-Wold, May Cottage is a quiet and delightful two-bedroom cottage providing luxury self-catering holiday accommodation for up to 4 people - and all on one level. 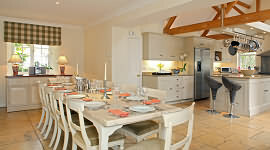 As a 5 Star Gold Award holiday property, the cottage is beautifully furnished and equipped to the highest standard. Our guests receive a special welcome hamper and there are discounts for the retired and for longer stays. May Cottage, which is adjacent to a Grade II Listed building, is built of honey-coloured Cotswold stone, has lovely arched Gothic windows. There is a large living room with a log fire, a conservatory, master bedroom with king-size bed with and access to en-suite bathroom with walk-in shower, separate bath and under floor heating. The second bedroom, which has separate access to the bathroom, has twin beds. The fitted kitchen has everything you might want and is finished with granite worktops and travertine flooring. 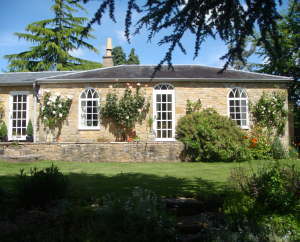 The cottage is very light and peaceful, and warmed by central heating. The cottage faces open country but is only within a few minutes walk from the famous market Square. Box Cottage is a beautiful little detached stone cottage in the village of Broadwell. It is only 1.5 miles from Stow- on-the-Wold And is the perfect place for couples to unwind for a relaxing holiday or to use as a base for walking. It has plenty of character and charm throughout. The double bedroom with king size bed, has exposed oak beams, a high sloping ceiling and lovely open views across the Cotswold countryside. The bedroom has an en-suite bathroom with over-bath thermostatically-controlled shower. The cosy sitting room’s focal point is the stone hearth that has a wood-burning stove for which an initial supply of logs is provided. The newly fitted, well-equipped kitchen has a door leading to the south facing garden area. 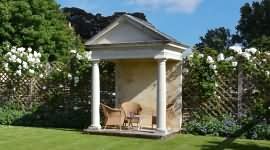 This is accessed by a trellised, walkway through to your own "secret garden" overlooking fields. Garden furniture and BBQ are provided. Box Cottage is within easy walking distance of the award winning pub, The Fox which sits on the village green and serves excellent food. 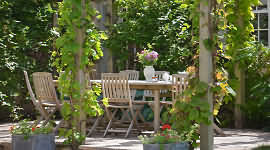 The famous market towns of Stow-on-the-Wold and Moreton-in-Marsh are only a short car drive away as is the Daylesford Organic Farm Shop in Kingham. Several National Trust Properties are nearby including Hidcote Gardens. Box Cottage has recently been refurbished throughout and is very well equipped to ensure you have a relaxing and comfortable holiday. Sorry smoking is not allowed inside the cottage. No pets. Price per week - £350 to £450 Christmas/New Year £450. Originally the Gamekeeper's cottage for a large local estate, this delightful property sits comfortably next to the Grade II listed bridge over the River Dickler and backs onto private woodland, in the small hamlet of Upper Swell. This spacious property provides an ideal rural setting for a family holiday, with Stow-on-the-Wold only a mile away with its eclectic mix of quality shopping, restaurants and pubs. The Heart of England Way runs adjacent to the cottage, and a 15 minute walk along this public footpath, through the magnificent grounds of the Abbottswood Estate, will bring you to Lower Swell where the Golden Ball Public House offers good food, an open fire and a warm welcome. From Lower Swell, you can continue along the public footpaths for a further two miles, to the charming and much photographed villages of Upper and Lower Slaughter. Surrounded by Cotswolds countryside in picturesque village of Bledington 4.5 miles from the famous market town of Stow-on-the-Wold. 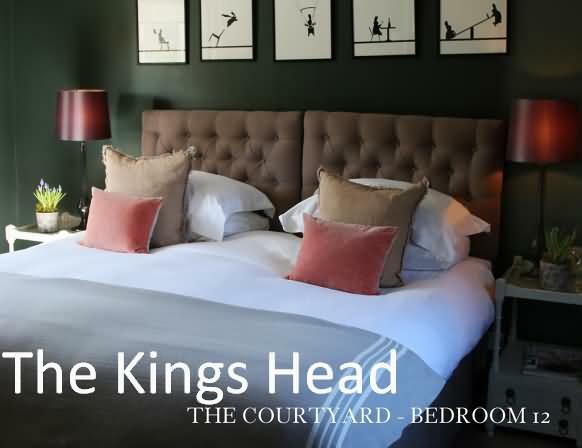 Kings Head Inn offers beautiful bedrooms with free Wi-Fi and parking. Set in a 16th-century building, there is a traditional restaurant and courtyard garden. The rooms at Kings Head have private bathrooms and elegant decor. Some have exposed beams and sloping ceilings, and all feature a TV and cosy seating area. Toiletries and tea/coffee facilities are also provided. The 1-AA-Rosette-awarded restaurant serves contemporary/traditional English food based on fresh, locally-sourced produce. The charming bar boasts original features and open fires, and offers a range of beverages and snacks. Cooked breakfasts are also served daily. Just 25 minutes’ drive from Blenheim Palace, the Kings Head is centrally located for exploring the North Oxfordshire Cotswolds. Both Oxford and Stratford-upon-Avon can be reached in 45 minutes’ drive. It is 15 minutes' drive from the A44. This property also has one of the best-rated locations in Bledington! Guests are happier about it compared to other properties in the area. A beautiful inn in the heart of the Cotswolds, The Lamb Inn offers a country-style restaurant and bar alongside its luxurious room and suites. Just outside picturesque Bourton-on-the-Water, there is free parking and Wi-Fi at this Gloucestershire hotel. 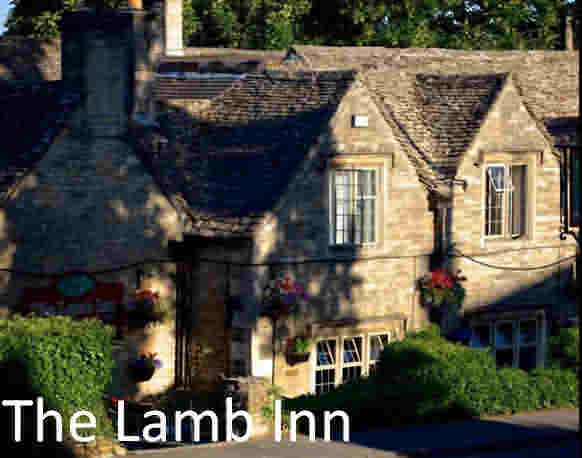 The Lamb Inn offers a range of spacious suites with king-size beds, and smaller double rooms. 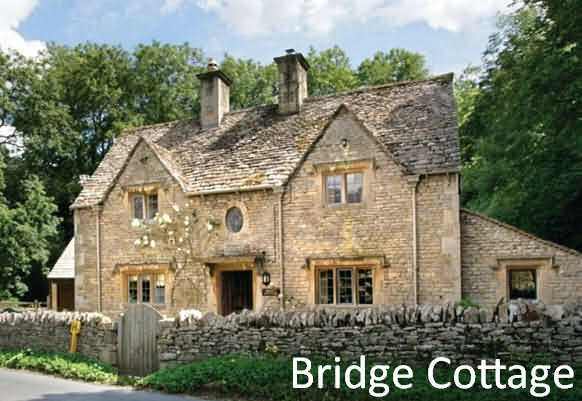 Many have exposed Cotswold stone walls, and all have private bathrooms, a TV and tea and coffee facilities. The rustic Lamb Inn restaurant serves the finest produce of the Cotswolds, in a relaxed and intimate atmosphere. High-quality house wines and a range of real ales are hallmarks of the cozy bar. Great Rissington is within easy reach of Stow-on-the-Wold and Chipping Norton, and the attractive cities of Oxford and Cheltenham are 30-40 minutes’ drive away. Animal lovers can enjoy a visit to Birdland, just 3 miles away, or the Cotswold Wildlife Park in Burford, less than 10 miles from The Lamb Inn.